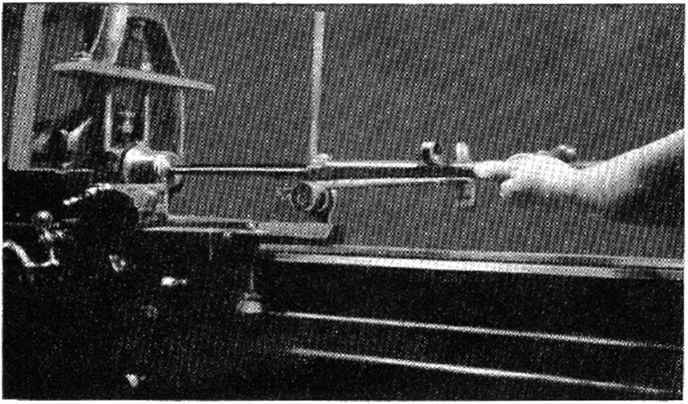 Various methods which may be necessary in fitting a loose forearm. A shows tightening the forearm by straightening out the curve of the spring in the vise jaws. B shows curved spring type forearm being peened out to lengthen it. C shows a sliding-type forearm catch being lengthened by peening the end with a ball pien hammer. a little too long to fit, then reharden the spring and draw it to the proper temper, then file the end until it is the proper length to fit. The sliding-type fore-end catch may become worn, until the forearm is loose. When this happens, the catch can be heated and drawn out a little by forging, filed to proper length and rehardened and tempered at straw color. If the old catch cannot be lengthened by forging, a new one can be made of tool-steel, hardened and tempered as directed above. Broken parts such as the action frame should never be brazed or electrically welded. 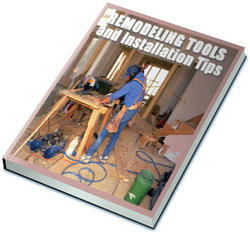 Any welding should be done with a gas torch, as the work is more thoroughly heated that way and makes a better weld. Brazing is usually too soft, as the brass used in making the joint will sometimes be pounded out a little, making parts bind upon each other and may throw strains, set up in firing the piece, upon the wrong parts of the action. When new firing-pins are necessary they should be made of chisel-steel, hardened by heating to a cherry-red and quenching in oil, after which they are tempered by heating to deep blue and again quenching in oil. Broken hammers should not be welded, new ones should be made up of tool-steel, hardened in oil and the temper drawn at deep blue or a light purple. It is sometimes necessary to cut off the muzzle of a shotgun barrel, due to its having been burst or injured at this point. This means that the choke is removed from the barrel, as it lies in the last two or three inches at the muzzle. While the full amount of choke cannot be replaced, some choke can be put in the barrel unless it is extremely thin. If the gun happens to be a single-barrel gun it can be chucked in the lathe and a new choke bored from the muzzle end. This choke should start V/2" to 2" back from the muzzle, leaving this length of barrel at the muzzle straight. The barrel should be bored out for a distance of about 2" in length to a diameter .007" or .008" larger than it was, with both ends of this recess bored on a taper so that no abrupt shoulder is left at the ends. As the boring tool will not leave a smooth enough finish in the recess, it will have to be polished after being bored. Expanding rubber mandrel (A) with strips of carborundum cloth glued onto the rubber being used to cut a recess choke in a shotgun barrel. This method may also be used to remove the choke from a barrel. B shows details of this expanding rubber mandrel. cloth followed by crocus cloth. A steel mandrel about 6" long with a solid head upon it is used to mount the rubber upon. The rubber can be about V/z" long and is slipped onto the steel arbor and pushed up against the head. The shank of the arbor, starting about 1" below the head, is threaded for the nut that screws onto it to expand the rubber. This nut is made quite long, although only part of it need he threaded, so that when the rubber mandrel is clear at the rear end of the choke, the nut is even with or only slightly inside of the muzzle. The purpose of this long nut is to allow the rubber mandrel to be inserted into the choke portion not expanded, and then expanded while in the recessed portion of the barrel by tightening up the nut. The outer end of the steel arbor is held in a drill chuck in the tail stock of the lathe while the barrel is revolved in the lathe spindle. The rubber mandrel, with the carborundum cloth cemented on it, is moved back and forth from one end of the choke to the other, while the barrel is revolving, by the tail stock screw. The recess should be polished out to .010" or a trifle more. It may be necessary to replace the carborundum cloth with new pieces while polishing out the choke, as it wears down. In case the gun is a double-barrel gun, or in case for some other reason the barrel cannot be chucked in the lathe to have the recess choke bored in it, the entire job may be done with the rubber mandrel and carborundum cloth. In this case, the recess is started and carried practically to finish dimensions with carborundum cloth, after which the polishing is done with the 000, followed by crocus cloth. The arbor upon which the rubber mandrel is mounted can be placed in a chuck in the live spindle of the lathe and revolved while the barrel is held in the hands, or a motor with a drill chuck mounted on its spindle can be used to drive the rubber mandrel, or the mandrel can be chucked in the drill press. Always unscrew the expanding nut of the rubber mandrel before drawing it out of the muzzle and do not tighten it up until the mandrel is replaced in the recess choke, so that the bore at the muzzle will not be enlarged. It is sometimes desirable to relieve the factory choke of a shotgun barrel, as it may shoot too close with the loads used. This is done by enlarging the bore at the muzzle. 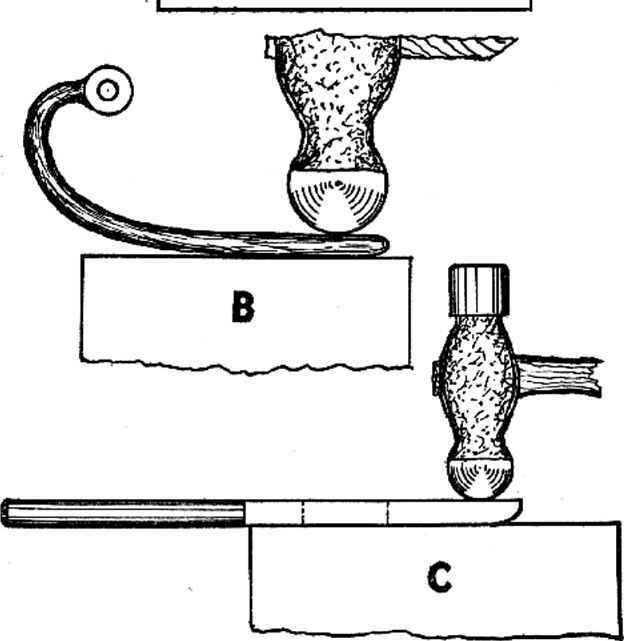 This may be done with the expanding rubber mandrel with carborundum cloth cemented to it, by placing the mandrel in position back in the enlarged portion of the barrel and expanding it with the nut, after which it is started revolving and brought slowly out to the muzzle then run back again and the performance repeated until the straight muzzle portion of the barrel is enlarged the required amount. Removing .012" to .015" inside the muzzle will reduce a choke from full to three-quarter. An automobile piston pin hone may be used for this job, if you can obtain one of the correct size. Choke alterations can be accomplished by means of a proper sized piston pin hone, which will remove part of the choke. These hones are adjustable for size and burnishing blades may be obtained as well as hone stones. Shotgun barrels will often require polishing out, due to neglect that has caused small pits or rust spots, or a new barrel may be rough enough to lead sufficiently to spoil the pattern after a few shots. The simplest method of doing this polishing is to mount a steel rod in the lathe chuck with a slot about 4" long sawed down from the outer end. Place carborundum cloth cut 4"
A steel rod slotted lengthwise for 4 inches at one end, so that carborundum cloth may be wound around the rod in 4 inch strips, to polish out the bore of a shotgun. The rod is held in a lathe chuck and revolved by power while the shotgun barrel is held in the hands and run slowly back and forth over the revolving cloth. wide around the outer end of the rod by placing the end in the saw-slot and wrapping it around the rod in the opposite direction from that in which the rod is turned. The fineness of grain of the carborundum to be used will depend upon what condition the barrel is in as to pits or rust. If little rust and only small pits appear, #y2 followed by gradually finer through the polishing stage will answer the purpose. The final polishing should be done with oiled carborundum cloth of 000 grain, followed by crocus cloth used dry. These final polishing operations are done with the barrel held stationary in a vise or lathe chuck and the polisher operated by hand, lengthwise of the barrel. The polisher is turned a little from time to time during the polishing operation, so that all parts of the barrel are polished evenly. The barrel should show no scratches and should have a mirror polish if no pits are present. A solid dent raiser, made of steel, used to start up deep dents in a shotgun barrel. It is driven through the barrel, beneath the dent, with a heavy steel rod and hammer, and should be a close fit in the barrel. tool-steel, hardened, ground and polished. The ends of these solid steel dent-raisers are tapered off at 15 to 20 degrees, so they will start a dent up easily without tearing the inner barrel surface. Three inches is a good length to make them, and a heavy hard-wood dowel rod or a steel rod is used to force them beneath the dent, with taps from a hammer. The barrel and the dent-raisers are both oiled with a light oil like sperm oil. Using a 5/k" steel rod with a carborundum cloth wound upon it. to polish out a 12 bore shotgun barrel held in the lathe. The steel rod shown in the lathe chuck lias a hack saw cut lengthwise of the rod, 4" long, at the outer end. One end of a 4" wide strip of carborundum cloth is inserted in this cut and is wound around the rod in the opposite direction from that in which the lathe turns. The lathe is run in its lowest open belt speed while the shotgun barrel is held in the hands and pushed and pulled slowly over the revolving carborundum cloth, which should be a tight fit in the barrel. making them leave an additional inch of length, so that a lathe dog may be clamped on them. After sweating the two pieces together, cut the ends off at an angle of about 80-degrees to the sweated splice, the ends being parallel to each other. Now center the ends and, placing the lathe dog on the pieces, place them between centers on the lathe and turn them to bore diameter, plus .012" or .015" and taper off the ends at fifteen or twenty degrees for a short distance, %" will be enough. Enlarge the center-holes to about %<$" diameter, if they are not that large, and drill the pieces with a 1 %4" hole from end to end. Drill out this hole from one end to the sweated seam with a drill and tap the remaining portion of the hole with a % 24-thread tap. Turn a groove three inches from one end, almost cutting the piece off, so that after it is hardened it may be easily broken off at this point. Details of expanding dent raiser for removing dents from shotgun barrels. Heat the two pieces until the solder melts and they can be separated, clean the soldered faces of all solder and harden both pieces, drawing them slightly at pale-straw to relieve strains afterwards. Resolder the two pieces together and grind them to just under standard bore size, then polish the surfaces until no grinding marks remain. The one inch of extra length may now be broken off at the grooved place. Remove the solder from the pieces. A piece of %0" drill-rod is now threaded for 3" with a 24-thread % a" die and a nut is screwed up very tightly to the end of the thread. This nut is turned off on the outside diameter so that it clears the thin end of the expansion mandrel and a washer of the same diameter is placed against the nut. An iron valve wheel is placed upon the opposite end of the rod and pinned in place. When the threaded end of the rod is placed through the drilled out portion of the mandrel and screwed into the threaded portion and tightened up, the mandrel expands in one direction. The barrel and mandrel should both be oiled with a light oil while removing dents. 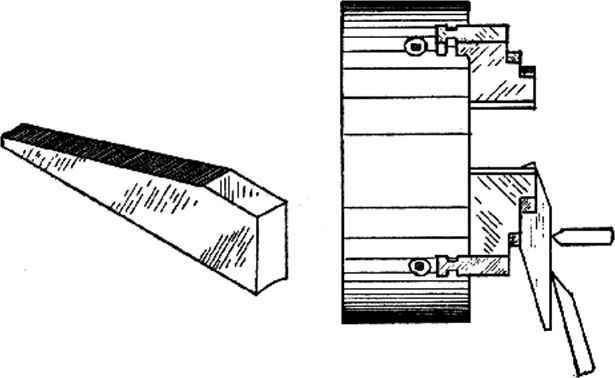 Showing method of using expanding dent raiser in shotgun barrel while the dent is being hammered lightly from outside with a Stanley composition-faced hammer. inside, as this hastens the removal of the dent and lessens the strain on the barrel set up by the expanding mandrel. ally a pump or autoloading shotgun that suffers in this respect and the bulge usually occurs just at the rear end of the choke, sometimes going as far forward as the front sight. The cause, in this case, is generally a heavy high-velocity load of #2 shot, which does not seem to chamber well in a 12-gauge choke. Bulges sometimes occur at other points in a shotgun barrel, but in that case the barrel usually bursts instead of merely bulging, for these bulges at points other than the rear end of the choked portion of a shotgun barrel are invariably caused by obstructions in the barrel when the cartridge is fired. Cross section showing two brass blocks, cut out to fit around the outside of a shotgun barrel, to clamp together over a bulge, while a steel mandrel is placed inside the barrel. and the mandrel should fit closely enough so that it requires a heavy rod to push it to place in the barrel. Roller pipe-cutter, fitted with three rollers, used to iron out a bulge in a shotgun barrel. A steel mandrel is placed within the bore, as in using the brass blocks. The barrel may be held in a well-padded vise and the brass blocks clamped around the barrel with a small machine-type vise like one of the "Yankee" vises. The vise is tightened up, causing the brass blocks to squeeze the bulged portion of the barrel in upon the steel mandrel, the vise is then loosened and the blocks moved around the barrel a short distance upon the bulge and again tightened. After the bulge is pretty well pressed out, oil the barrel well at that point and tighten the blocks upon it again with the vise, but not too tight. Take hold of the outer end of the vise screw and turn the vise and brass blocks around the barrel upon the bulge, tightening the vise a little from time to time, continuing this until the bulge is ironed out. type pipe-cutter is used. A #1 Trimo three-wheel pipe-cutter is then equipped with three rollers, instead of two rollers and one cutting wheel, and after the steel mandrel is placed inside the barrel, under the bulge, the barrel is oiled on the outside and the pipe-cutter with three rollers is used to iron out the bulge. The notched brass blocks may be used to pound the bulge out of the barrel by placing the steel mandrel inside the barrel as before, placing one block upon the bench with the barrel lying in it, at the bulged point, laying the second notched brass block on top of the bulge and striking the top block with a medium-weight hammer. Turn the barrel as necessary to pound out all the bulge. When the barrels of double-barrel guns are cut off for any reason at the muzzle, the opening between the ribs is exposed and must be refilled with solder. Scrape and clean the opening very thoroughly for a distance of about %6" back from the muzzle, cut a piece of tin to fit closely in the opening and press this in and back an eighth of an inch or more from the muzzle. Use rosin core solder to fill the opening above the piece of tin. After the solder has cooled, file it off flush and polish across the muzzles with fine carborundum cloth on a flat wood block. In cutting off the barrels at the muzzle, always use a machinist's square to mark the barrels for sawing and also afterwards, while filing the ends, to make sure that the muzzles are square. Use a piece of fine carborundum cloth glued onto a steeply-tapered, round piece of wood, small enough at the small end to go inside the barrels, so that the inner edges are slightly rounded off, to remove any burr that may be left at that point. How to Make a Shotgun Barrel Dent Raiser? How to made rifle barel? How to make short gun? HOW TO POLISH SHOTGUN CHOKES? How to remove ding from gun barrel? How to make a shotgun barrel dent remover? How to repair a dent in a shotgun barrel? How to remove a dent from a shotgun barrel? Who to make a shotgun barrel dent removal tool? How to make gun barrel torch? What To charge cut off and repair a shotgun barrel? How to remove a dent from a shotgun barrle?